About a year ago my teen daughter introduced me to my very first mocha. Before that I was NOT a coffee drinker. The smell was nostalgic as it reminded me of my grandparents who drank coffee 24/7, but I always thought coffee was more like bitter black water... ew. Then after some coaxing from my daughter I tried the Peppermint Mocha Latte at Starbucks and that opened a whole new world to me. As a lover of all things chocolate, I never really thought of combining chocolate and coffee. And now I ask myself...What took me so long to discover this heavenly taste combo? After this grand discovery I found myself constantly stopping by Starbucks. That got pretty expensive. I had to find a way to treat myself without breaking the bank. I needed a way to make it at home without the fancy equipment. I also didn't want it to take forever to make; it's a treat not a chore. 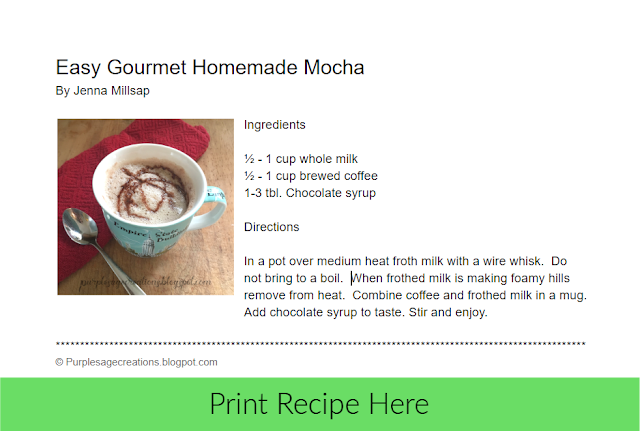 After a bit of experimenting I discovered a way to make an easy gourmet style caffe mocha in my own kitchen. Basically a caffe mocha (or just mocha) is coffee, milk and chocolate. How much of each you add to your mug is up to you. I like half coffee half milk and then chocolate syrup to taste. Some people like to add powdered hot chocolate mix to their coffee. The coffee you use depends on your taste as well. Some like a more robust, dark roast while others prefer a blond, light taste. Experiment a bit to find your liking. 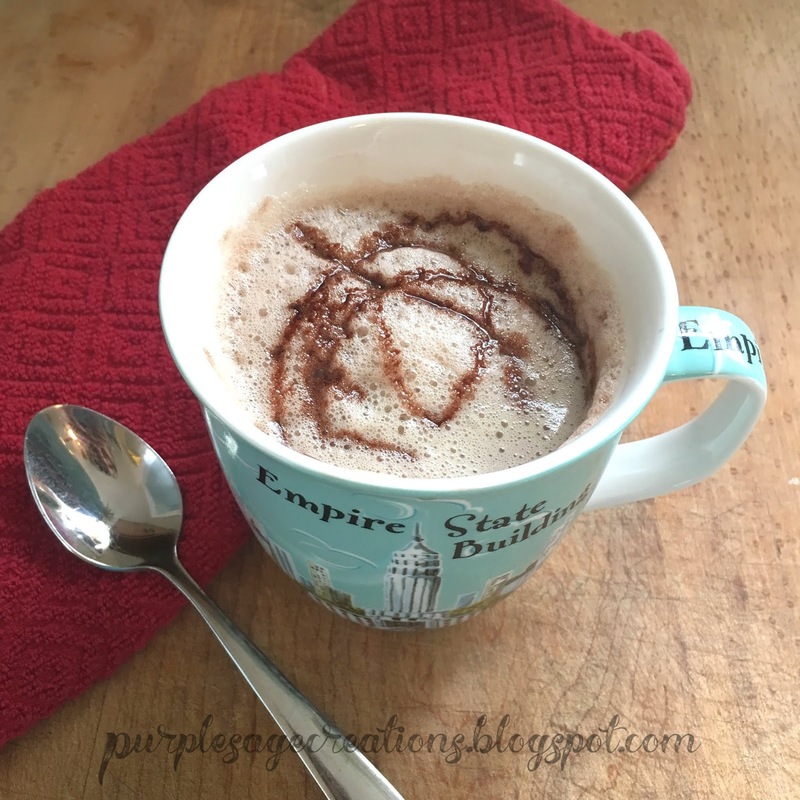 The trick to making a gourmet style mocha is frothing the milk. In order to get a good frothy foam is to use whole milk. Even better is if you can get your hands on farm fresh raw milk. It's far more creamy; which is what creates the froth. Brew your coffee of choice. Then froth your milk... In a pot over medium heat add 1/2 to 1 cup of whole milk. How much milk you use depends on how much you like with your brewed cup of coffee. As the milk warms vigorously whisk the milk to create a foam. Keep whisking to until you create foamy peaks (like in the picture above) but don't bring the milk to a boil. Remove from heat and add to your cup of coffee. Add chocolate syrup to taste and stir. Add whipped cream for an extra special treat. Sit back, relax, and enjoy. 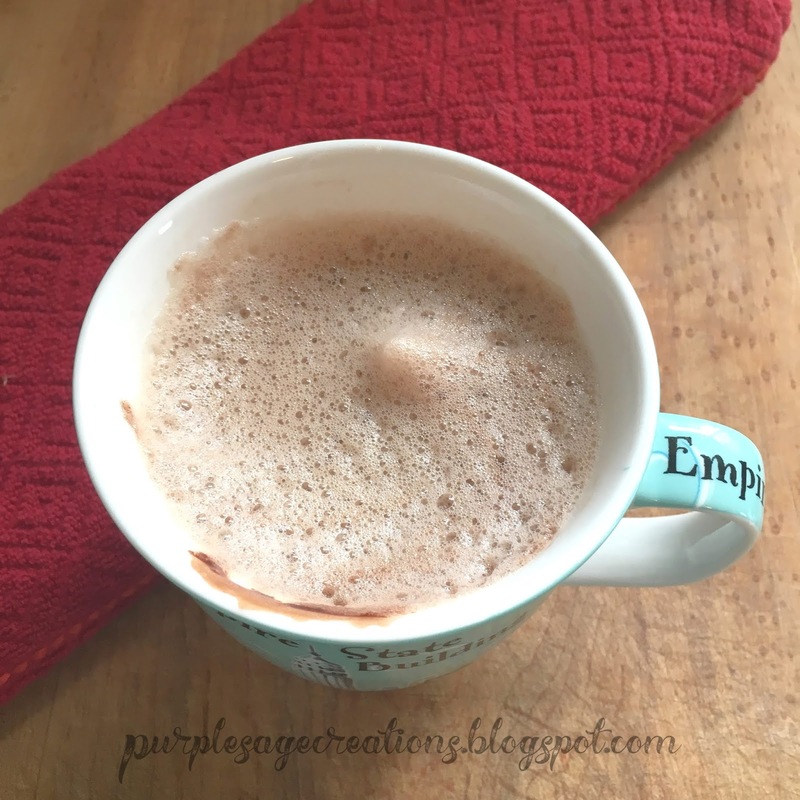 Join me on Instagram at @purplesagecreations to see more of the12 Days of Mochas.